You may remember this piece from some months back. I donated her sister to the Pratt Fine Arts auction. 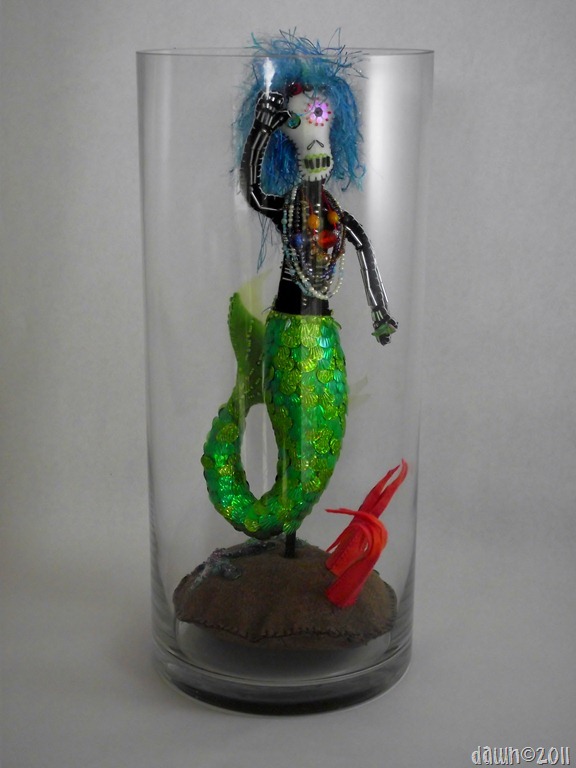 A day of the dead mermaid, kind of pretty, mostly creepy. I love her so much. She is made of felt as the base, then encrusted with beads and sequins. Her “bones” are bugle beads. It’s a little hard to see but she is beaded front and back on black felt to look like a skeleton. She is covered in necklaces. Her hair is made from metallic embroidery thread. I’ve made one “real” mermaid but was not nearly as happy with her as I have been with this version. Thanks so much to my friend Leslie, who’s print of a day of the dead mermaid inspired this! Check out her website for some amazing linocut prints, including her most recent series, Day of the Dead Wizard of Oz. I’m not kidding, it’s a fantastic combination.